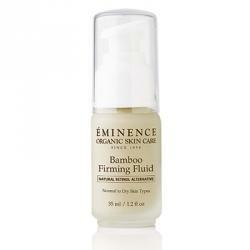 For tighter looking skin, the Bamboo Firming Fluid is the answer. The strengthening agents of bamboo and coconut deeply hydrates, with the help of a Natural Retinol Alternative and Swiss Green Apple Stem Cells. Application: Put a pea size amount onto fingertip, then press all fingertips together so that product can be quickly patted onto skin.